We sailed Columbus out of Tilbury on 4th August 2018 Never sailed with CMV before, but have sailed with royal, celebrity, NCL, Marella and Cunard We found the ship to be in good condition for her age, We had an ocean view cabin 6161, loads of storage space lovely big window with lots of natural light . Tv tiny and sound shocking. Shower plenty of powerful hot water. The inside of the ship has a spacious feel, with the exception of the buffet area which felt cramped. The main dining room was well laid out, and good service and food, with the exception of Greek night. Entertainment was a bit hit and miss. 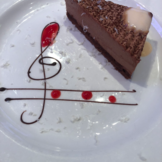 The classical music in the atrium each evening was very enjoyable. The oasis bar area with jacuzzi was a lovely area of peace and quiet. And adults only on this multigenerational cruise. We would sail with CMV again. This is a get what you pay for cruise , cabins large , beds hard . 1500 passengers approx 200 sunbeds , whitnessed actual fights over them . Food in buffet weird , meat , no potatoes lots of veggie food so they saved money on meat . Chips once one lunch time for adults , kids menu same every night , only one type of egg at breakfast hardly any days for fried eggs for your bacon. Entertainment dire , same in bars every night for two weeks. Multi generational cruise then kids banned from certain pools . Then to top it all itinerary changed to a lot of half days passengers agreed you hadn’t got time to do anything . 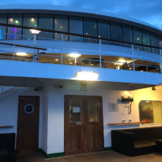 July 9, 2018 Grand British Isles Discovery Cruise Cruise and Maritime Voyages did a marvellous job making our cruise a memorable experience in every good way possible. Columbus is a great small classic cruise ship (max 1400 passengers) Staff was friendly and very attentive, food was stellar, entertainment was first rate and all for a very affordable experience. The itinerary was amazing, seeing small remote destinations overlooked by most of the large cruise lines. Portree in the Hebrides, Scilly Isles, Guernsey, Honfleur, Cork etc plus the regular larger ports. Excursions were first rate with excellent local guides at affordable prices. Overall a very good cruise, with the exception of St.Petersberg give optional trips a miss. Cabin was excellent, loads of storage, comfy bed, quiet. Public areas including bars, theatre, open decks all very nice. Plenty of sunbeds available. Staff on the whole extremely good. Entertainment team very talented but unfortunately only did three shows in two weeks . They also did solo performances which were not as good. Uk guest acts were average. Food ranged from ok to very good but was usually spoilt by being unbelievably salty. With the majority of passengers being over 65 I'm sure some will have blood pressure, heart and kidney problems so salty food not the best for them!! Only one formal night out of 14 then 13 casual nights was also disappointing, but obviously didn't spoil our enjoyment. Would do it again! Very disappointed with the level of service and customer service on this ship. Much better on Magellan, although not perfect. Ran out every morning of clean glasses and mugs. Food in waterfront amazing but service so slow! Night two an hour for main course. Problems getting dairy free anything. Hot tub not running, don't care it's cold out brochures state this is available. Jacuzzi available in spa.... €40 each!! ( that was also out of order) We thought it quite dated in cabins. It's been upgraded but not with a great finish; found screws in various places. Cabin 6203 very noisy, turned out bar is above it. Have no intention of going on this ship again and would not recommend it. Due to a storm in the North Sea Columbus was approx 8 hours late docking. Not the fault of the company, but a decision by Thames pilots to suspend boarding ships until storm had died down. Columbus due to leave port at 15.00hrs, actual leaving 23.00hrs. Each passenger given £25 on board spend as compensation. Although we arrived early for embarkation the company had laid on buses to take us to Lakeside shopping centre, as Tilbury terminal has limited facilities. Embarkation went well at approx 17.00. Due to late embarkation we were unable to arrive at Copenhagen in time and had an extra day at sea. Although Columbus is an older ship, first launched in 1988, it is a lovely ship and has some character which can be lacking in some of the newer ships. Cabins were spacious, clean and comfortable. Public areas were good and furniture up to an acceptable standard. There were one or two areas which were a little tired, but I am being picky here and these areas did not spoil the enjoyment of our experience. Food in the Waterfront restaurant was excellent, and none of the people we shared a table with felt the need to try the pay for speciality restaurants, although I heard from other passengers that the were very good. I will not comment on the buffet as we did not use it very much, but it seemed popular. The on board entertainment team were excellent and put on 5 shows ranging from Rock and Roll, Broadway, Queen tribute, musicals and opera, all were good. Four shows were put on by a comedienne, 2 shows and a magician/comedienne 2 shows. There were also lectures and other events on sea days which I found enjoyable. I have read some negative comments about the cruise director, but I can only praise him and his team for a job well done. The highlight of the cruise was an overnight in St Petersburg well worth a visit. 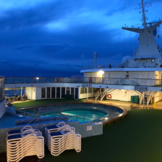 My only negative was the amount of piped music throughout the ship and the huge TV screen above the pool area which played all day, something which I found distracting. NB other people did not agree with me. We met some really nice people on board and everybody was friendly. We thoroughly enjoyed our cruise and I believe the cruise director was right when he remarked "This is not a cruise ship it is a friendship"
If you choose to follow Columbus you will receive weekly email updates with the latest reviews, tips, and photos from Cruiseline.com members about Columbus.